I took inventory at the Herschel Hoard and found that I actually have more different cards than what I originally thought. 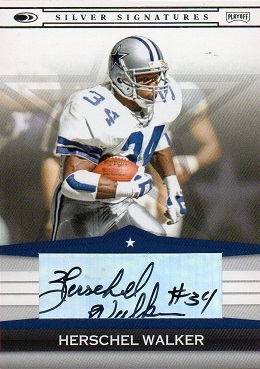 I now have a total of 650 different Herschel Walker cards. 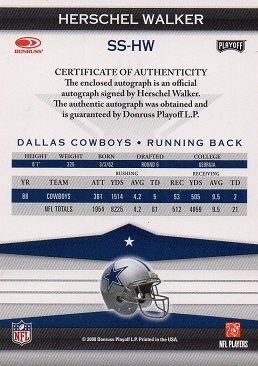 This 2008 Donruss Silver Signatures card, which I just purchased, comes in at #650. The Trading Card Database currently lists 895 cards for Walker, but of course that figure changes as new sets are added. Many of those cards are 1 of 1's, and even those that are serial numbered 10 or less are going to be tough to come by. But I'll keep plugging away, and adding new cards when possible. The 2016 Panini Recollection Collection borrowed this image for that set, and I'm proud to say, that card is in the Hoard as well.